With our cardboard shredder, convert old cartons into soft packing material, save on expensive plastic materials, Made in Germany, sold extensively in India, Eco friendly and in-house packing material anytime available on hand. Pack anything safely, cheaply and with satisfaction of doing your bit for the environment! Cardboard shredders offered by one of the leading shredding equipment dealer in India. Where value, quality, and customer support is offered to our respected customers. Partner with SASCO cardboard shredders to build a more sustainable environment! Discover the success stories of the SASCO shredders and you will learn how to dramatically reduce your packaging costs. Learn the added benefit of reduced shipping damages with sustainable packaging produced by the SASCO shredders which are Eco Friendly Packaging Equipment. SASCO©, a company that has led the globe manufacturing the world's most reliable cardboard shredders, salutes the early adopters, these Green Champions, for their foresight in building a more sustainable environment. We offer the most complete product selection of cardboard and corrugated box shredders. Cardboard shredders have become one of the best solutions to reducing packaging costs by converting cardboard boxes into excellent and soft packaging material. 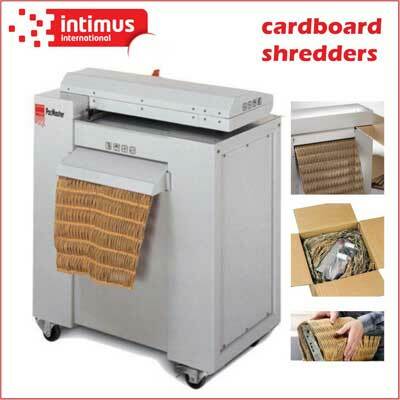 INTIMUS cardboard shredders are some of the leading cardboard shredders in customer satisfaction sold all over the world. Improve your packaging by converting waste corrugated boxes into excellent cushioning material and reduce costly packaging material expenses by investing in cardboard shredders from INTIMUS. Make sure to visit our fine line of industrial shredder for excellent values if you are looking for volume reduction machines.